This breakthrough formula is completely unscented and scientifically tested to provide the maximum levels of odour elimination and prevention. It contains advanced, cosmeceutical ingredients with Microzeolites, Witch Hazel and Tea Tree Extract targeting and helping to eliminate odour-causing bacteria without the potentially damaging effects of alcohol or aluminium. Eliminates and prevents odours instead of masking these with fragrance or blocking sweat ducts with aluminium-based components. Smooth, dry and clear application is non-staining and absorbs immediately. Non-irritating, hypoallergenic formula is ideal for sensitive types. Propylene glycol, Acqua purificata (purified water), Sodium stearate, Cornstarch, Talc, Styrene/VP copolymer, Triclosan, Allantoin, Sodium bicarbonate, Aloe barbadensis extract (aloe vera), Tocopheryl acetate, Glycerin, Camellia sinensis (green tea) extract, Chamomilla recutita (chamomile) extract, Hamamelis virginiana (witch hazel) extract , Melaleuca alternifolia (Tea Tree) extract, Rosmarinus officinalis (rosemary) extract, Achillea millefolium (yarrow) extract, Zeolite. Constantly on the search for a alluminum free anti-perspirant, I tried this. It worked for a while and then, as mentioned by other reviewers, made me sweat more and on occassion left a slight burning sensation. It might be worth purchasing to see if it works for you, but with such a high price tag, it probably isn't sustainable with better products on the market. This is undoubtedly the best deodorant I have ever experienced! It does not create unpleasant odors, it leaves the skin comfortable and it does not stain the clothes! I am not a sweaty person and a shower twice a day, but this product isn't worth the money at all and doesn't really last the day. The only deodorant to have made me sweat more! Really poor deodorant from what is otherwise a great brand. This is the only deodorant to have made me sweat more! Doesn't last the day and is certainly not anti-perspirant. Expensive also. Been a long term user of this, nut have discovered over some time of using it, a yellowish stained colour started appearing in the under arms of any white tshirts I had, that doesn't seem to wash out, so wont be buying again. Purchased this on the back of the reviews. I have tried a number of diffrent products to stop underarm wetness, however, this looked to be a good potential winner. Applies well and thats about it. the product did not stop the wetness and by the end of the working day, I needed to top up with my usual brand. I have never suffered from odour under the armpits before, just the wetness which inturn, leaves staining to shirts. This product eliminated neither, so woudl not purchase again. In fact, after only two days of using have stopped using the deodorant full stop. In my view, it was a waste of money and I am very dissapointed with the results. 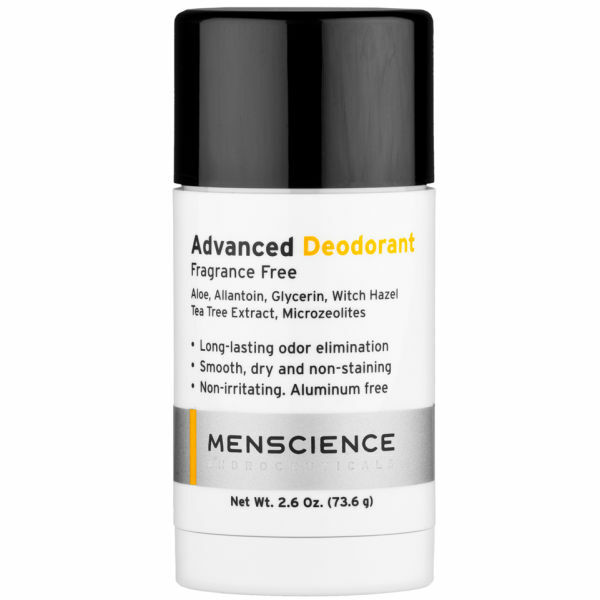 Menscience Advanced Deodorant is alcohol and fragrance free and eliminates \ prevents odours unlike most high steet brands which try to mask it with fragrance. However for the price you would expect it to eliminate / prevent odours completely. Read the reviews and thought I would give it a try. Would never go back to other deodorants. Although this has no fragrance this stuff really works and there is no underarm smell even after a hard days work. Highly recommended. I never really write reviews, I usually just read them and go by how good a product is. This deodorant is amazing, I sweat quite a lot and it gets me down at times so I've always been changing deodorants to find the best ones. Unfortunately I'd always buy super market ones which were priced between £1-£4 so I thought paying higher than that was a little steep for some deodorant but to be honest it's the best one I've ever come across. I never ever smell anymore and my sweating has dropped a hell of a lot to. I'd recommend this to anyone who suffers bad smelly sweaty pits, it works wonders believe me. This Advanced Deodorant is great. No aluminum, no fragrance and highly effective. It lasts all day too! This Advanced Deodorant is an excellent product. It does exactly what it says on the tin and, even though it is expensive, you do get what you pay for! This Advanced Deodorant is excellent! Exactly what it says, no stains on clothing which is fantastic, just throw a dark t-shirt with confidence and no odour after a long day! The only deodorant I will use from now on. This Advanced Deodorant is a good deodorant which totally works, will be only using this from now on. Advanced Deodorant is good stuff and highly recommended. 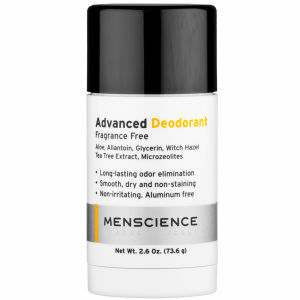 Advanced Deodorant is great for those with sensitive skin. It's not cheap but it's worth every penny as it does exactly what it sets out to do - keep you smelling fresh without stinging. I love this product. I was having problems with other deodorants with them agitating my skin but after hearing our this product i thought I'd try it out am I am glad I did. Although it is quite expensive compared to other products it doesn't irritate my skin and doesn't stain my white t-shirts, bonus! I would definitely recommend this product to anyone, it's worth the extra money. The Advanced Deodorant works fantastically well on me and nothing else has before so will definitely keep buying this one, never going to use anything else. Quite frankly I'm amazed a deodorant that works NO wetness, stains or odour already put my repeat order, you will not be disappointed. Advanced Deodorant is one of the best products I have ever experienced in the current market!